It was gorgeous and smelled delicious.... Finally, it's growing here! Here's a photo of what we can hope to have some day! Has no need for anything other than a level spot of lawn or garden. The new 'garden tree' is sited for maximum viewing...(You might even be wondering where in the world the stock tank can be found? I promise to finish that tale in another post!) I've been hoping to find a bottle tree that had a tree form. I think this one fits the bill. The flowering gaura has absolutely nothing to do with this post! It's just a pretty bloomer that's still going strong in the garden! I am so very glad you stopped by! Your bottle tree is one of the better ones I have seen. It is definitely a tree shape. Good find. Frances, It fit the bill beautifully...and the bottles came with it! 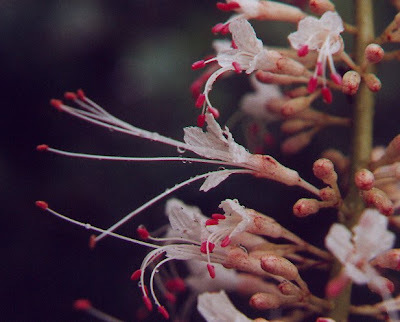 I think the Aesculus would be lovely in your garden~~the leaf form and flower are stellar! But, you would have to water it. Lisa, They are very slow growing, but aren't they great looking! Yeah!!!! It is a wonderful tree-both! I have two of the native bottle bush trees (babies like yours) and three of the glass type ones. Gotta love them all. Can I post a link on my sidebar under the bottle trees? Tina, Yes please do add it to the sidebar. Q...Since you added the aesculus to the garden, how much have they grown? Monica, I do love that gaura! I added on last summer during the drought and it has not grown much but I tell you I NEVER watered it even though it was newly planted. This year it is about the size of yours, maybe a bit smaller. 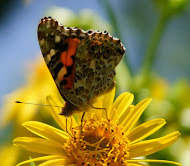 It was a gift from a friend who has a wildflower garden here in Clarksville. The second one I added this spring from the master gardener plant sale. Both of them have shown growth with all the good rains. I guess maybe about a 4-5 inches for both? Not too much but they'll pick up the longer they have been planted. Where I walk there are tons of these and they are so lovely. Thanks for asking and I'll add in your link. That is one terrific bottle tree. I am still collecting blue bottles for one. The bottle brush tree is going to look beautiful in your GOBN! 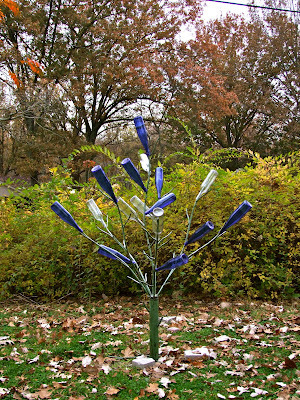 But the other bottle tree is quite an eye-catcher now--blue is my favorite color! Now, just where is that stock tank going to go? I love your new bottle tree, Gail, and especially where you placed it against those yellowing shrubs. Lovely! That Bottle Brush Tree looks great for fall color! I need to take a look at our gaura to see if its still going! Gail, I just love your new bottle tree - it's fabulous! I love bottlebrush buckeyes, and your own "native" bottle tree is fantastic. That cobalt blue sets off all the autumn golds perfectly! I didn't realize that Bottlebrush Buckeye was fragrant and had fall color too! What a beautiful native! Love the Bottle brush tree. Sure wish I had the room for one. What a beautiful bottle tree. That's exactly what I was looking for. I love both your bottle trees! The mature one (the MOBOT one) looks fantastic. I didn't realize they had whitish blooms. I must be thinking of some other tree with a similar name. My gaura is still eeking out blooms as well. It probably needs a rest by now! Dear Gail....the Buckeye bush is beautiful....I love the blooms on it and can imagine a beautiful hummer feeding from it. I like them both, and they'd look good next to each other. Wish I had room for the Buckeye. Anything that attracts hummers & has good fall color is appreciated. I think the bottle trees are so whimsical. Great fun. That Buckeye is a nice one. I have a few Gaura still blooming. Great little plant. Both of the bottle trees are great! It's too bad the Buckeye has suckers, or else it would be a good candidate for my shrub choice. I like your Southern bottle tree. I have the blue bottles - I just need a suitable tree but we are sadly lacking in craft skills, especially with metal. Hopefully I will find one before too long. 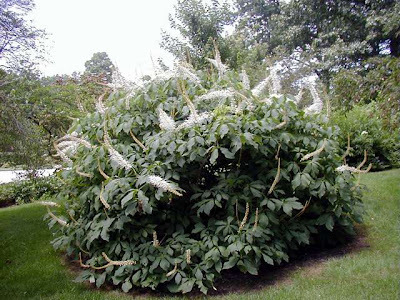 Your bottlebrush buckeye will be great (and a lot bigger). Ours has spread and suckered to be quite the robust specimen. We've even had to edit it a bit (not our usual practice). Happily, it was a lovely clear yellow this year, so was quite spectacular. It's remarkable how a fairly restricted native can be happy in a wide range of circumstances. Gail, you're all thumbs! ;-) I adore those spirally blooms. They seem outrageous for some reason or other, sort of wild yet luscious. Of course, the "real bottle" tree caught my eye. That's actually way cool! I noticed your Gaura and I wonder if you have cut the stems down yet. If not, take the stems and hang them upside down for drying. They turn more crimson than just about anything in Nature, I swear, and they make absolutely killer dried flower arrangements. They can stand up straight and you won't believe the color, as I said. Nice to see you again. 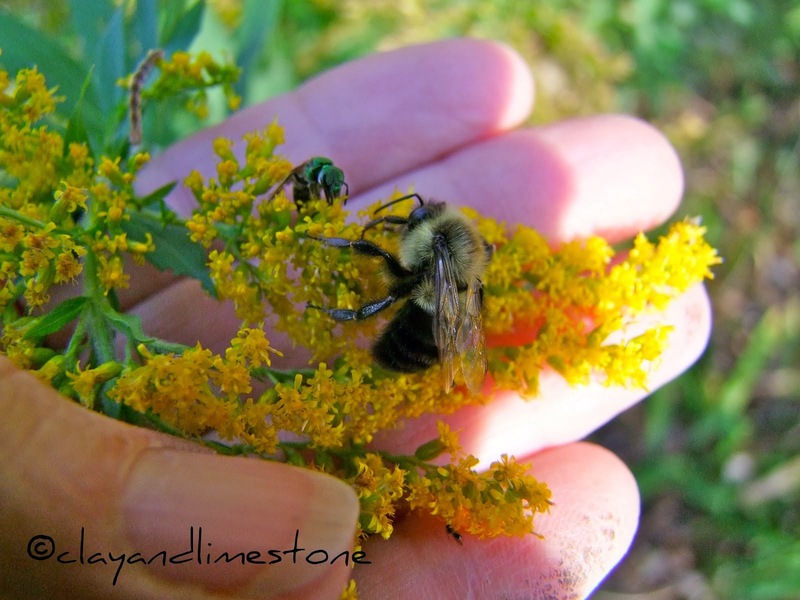 I am hoping to get out more, blogging-wise. LOL, you got me with that first pic. ;) What a lovely native shrub, it should be quite happy in the C&L garden. I love the bottle tree! I wish I had a tree that I could do that... I have gaura, too. Very pretty! Love the color blue in the garden and your Southern Bottle Tree is delightful, Gail ... a keeper! Your bottle tree is fabulous! I love the lines and design you created for the tree. I wonder what you have planted around the base? I love your new bottle tree Gail - it's one of the coolest I've seen. Great post you got here. I'd like to read something more about that matter. last few days our class held a similar discussion on this topic and you illustrate something we have not covered yet, appreciate that.